Jak and Daxter nearly made a comeback on the PS3 before Naughty Dog transitioned its team to another game. If you're a Jak and Daxter fan, this could be a very bittersweet week for you. On the bright side, you can rejoice with the release of the Jak and Daxter Collection on PS3. What may kill your mood, though, is the knowledge that developer Naughty Dog came tantalizingly close to developing a whole new PS3 game starring the beloved platforming duo before opting to work on upcoming action game The Last of Us instead. While the developer hasn't ruled out revisiting Jak and his furry friend at some point, expect to see The Last of Us and probably some more Uncharted first. "Something that we talked about early on was, 'Lets go back and apply what we've learned with the Uncharted games to Jak and Daxter,'" said Evan Wells, co-president of Naughty Dog. "It's one of the franchises that's near and dear to us, and, in all honesty, we'd like to somehow honor." These talks coincided with the foundation of a second design team at Naughty Dog. 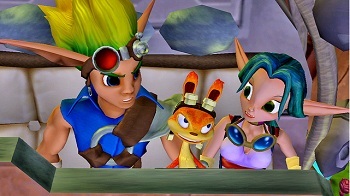 Wells initially thought that the new team could bring Jak, Daxter, and friends back to consoles after many years on handheld outings. As time went on, the ideas started to lose steam. "Even if we felt like we're going to give the fans another Jak and Daxter, we felt we weren't going to give them the game that they wanted ... We just realized we were going to just do everybody a disservice." A new game in the series is not impossible, of course, given that the franchise still has many fans and the company still possesses all of the relevant rights. "Naughty Dog's got a long history and I think it's got a long future, so to say we'll never go back is kind of crazy," Wells assured. For now, though, Naughty Dog fans will have to content themselves with a shiny HD collection, a potentially promising new IP, and Nathan Drake's hair - the one thing at the studio that remains completely unchangeable.